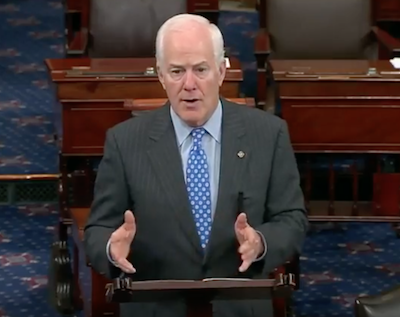 Today on the Senate floor, I stressed the importance of the United States remaining proactive with national security measures by reauthorizing Section 702 of the Foreign Intelligence Surveillance Act. Excerpts of my remarks are below, and video of my remarks can be found here. As the subway attack in London last week proves all too well, when terrorism goes underground, it doesn't disappear. As President Trump said last week, in this era in which attacks like London are the new normal, we have to be proactive. We can't take our security for granted. One way to be proactive and to keep our country safe is to reauthorize Section 702 of the Foreign Intelligence Surveillance Act. Information collected under one particular section, Section 702, produces particularly important foreign intelligence that helps prevent terrorist attacks against maligned state actors as well. Section 702 also includes a comprehensive oversight regime to make sure the privacy of U.S. persons is protected under the Constitution. That’s done by not only oversight here in the Senate and in the House through the Intelligence Committees but also by the Foreign Intelligence Surveillance Court, which monitors compliance with the law. This careful balance is why scholars at the U.S. Naval Academy commenting on 702 summarize that there is simply no good case for not reauthorizing it when it comes up for renewal. And colleagues, that time for renewal is fast approaching, and that’s why I today join the Attorney General and the Director of National Intelligence in recommending the speedy enactment of legislation reauthorizing Title VII before it sunsets later this year.